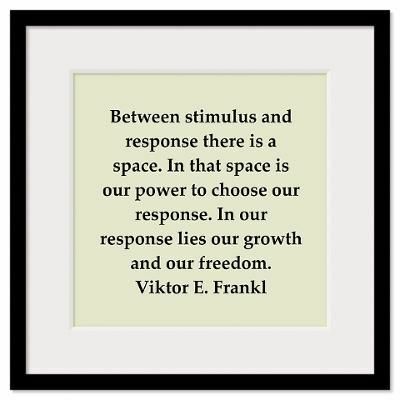 Take a moment and think about the following quote from Viktor Frankl. When I first heard this quote I was a new to meditation. I loved it so much and found myself using it as a sort of mantra in my life. I set an intention to notice different stimulus around me. At the time, I was teaching music in a K-8 Center. Needless to say, there was quite a but of stimulus. Each time a child was doing something that set off a reaction or response in me, I tried to remember to stop and pause. When I first started experimenting with this in my life, I was worried about all of the wasted time in the classroom if I were to stop and take a breath before answering a question or redirecting behavior. However, then I realized that one breath really doesn’t take that long. I mean, what had my life become that I couldn’t manage to take a breath and pause every now and again? So, I did. It changed my teaching. Over time and with a lot of intentional practice, I was able to see joy and spontaneity in the students (even when they were “misbehaving”). I was better able to relax and appreciate the different personalities. I was also better able to understand their questions and furthermore, appreciate their answers. I learned to respond, rather than react and I grew. The days I remembered to pause and be more mindful as a teacher were always my best days. I was full of energy and never felt drained. There is life in the pause and breath. Now, I don’t work with children anymore on a regular basis. What’s interesting, is that I’m not as good as remembering to pause, especially when dealing with adults. What is it about children than make pausing so easy and adults so difficult? My area of intention lately is to remember that we are all children of God (the Divine, the Universe, whatever you choose to call it). Regardless of our age, we are children of God. Children! We are all living, growing, learning, children. Let us intend to remember that everyone is a child of God and needs the same love, support, and space to grow as children do. We all have different personalities, gifts, and experiences to bring to the table and everyone deserves to be heard. Categories: mindfulness, yoga | Tags: freedom, meditation, mindfulness, pause, power, viktor frankl, yoga | Permalink.